Eleven contemporary artists demonstrate the importance of line and form within their art practice. Pure line and clean forms are represented while, in contrast, the richness and complexity that can evolve from these fundamental creative components is also celebrated. We have still not been to Ormskirk but we often hear good reports about the Chapel gallery and this current exhibition features the excellent Liverpool-based artists Arthur Roberts and Jane Hughes. Divine Proportion II is taken from six artworks on display by Arthur Roberts which form the Divine Drawing Series. 1.6180339887……… Phi, the Golden Section, the Golden Ratio or the Divine Proportion. The Divine Drawings are site specific, they react and develop from their environment, the Golden Section that surrounds them. Each element, line and form is born from another, each line and edge corresponds and reflects the golden ratio parameters, it plays with magic. The work explores imaginary synthetic digital environments which draws its inspiration from the machine, landscape, celestial skies and the microscopic world. This combination fuses to create a new spiritual mix reflecting our time. The alchemy of the works are non religious. There is no running away from history; the ghosts of modernism are present within the evolution of abstraction. We take fragments from the past and build new horizons for tomorrow. The layers of graphite dust are equal to the layers of time, which has travelled before us. More than ever painting and drawing is relevant today within our high speed society, we crave a need for stillness, to wonder, to dream and drift in our universe of imagination. 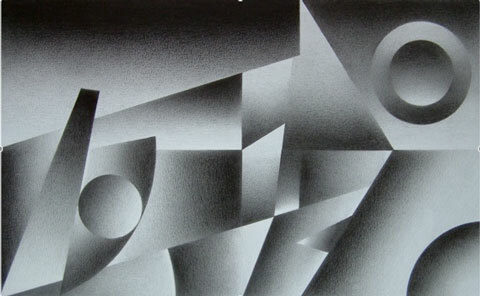 The medium is broken down to the most basic and accessible of artist materials, graphite on paper. The drawings take months to execute, progress is slow and time is a crucial ingredient as in stark contrast to digital processes, they mimic the computer but have as much in common with an ancient time. Stephen Cunliffe, Rachael Elwell, Jane Hughes, Karl Kolley, Niina Kuosmanen, Kelvin Livingstone, Nicola Plant, Kate Raggett, Arthur Roberts and Simon J Smith.